The homily and news feed for the Monastery of the Glorious Ascension in Resaca, Georgia. We are in the midst of Gospel readings having to do with Christ's many miracles that He performed within the midst all. This part of the season is one of my favorites. It is refreshing to hear of these many miracles in this day and age. Especially with all that seems to be going wrong around us. We modern Christians find it too easy to look at the world as it it exists today and find very little to be joyful about. We see the problems and tragedies of our brothers and sisters in the Holy Land and the greater Middle East and say to ourselves, where is God in all of this? We find ourselves thinking "What have I got to be excited about when there is so much terror and so much confusion in the world and heaven seems so far away?" This example given to us in the Gospel of Matthew is yet the second time that Jesus leaves the disciples alone to go and pray. He bids the disciples to go into a ship and go on before Him while is remains alone to pray. But the disciples find that the crossing is frought with high seas and great winds which toss them about, putting them into great peril of imminent death. The disciples cry out to Christ in desperation thinking that their end was about to come swiftly! Surely we can relate to their fears in our modern times! But let him who has ears hear the subtle truth behind this situation for it is a great truth and a parable to show us the path home. Now open the eyes of your heart, listen with the ears of your heart, and try to understand what the Lord is teaching us. The Fathers give us the key. You see, the disciples represent the faithful: that is, all of us gathered here. The crowds that had been gathered upon the hillside previously, you know, the 5,000 who were fed of the five loaves and the two fishes; they are the God-fearing people who are not members of the Church yet. The boat that the disciples were told to embark upon is the Church. The sea with it's deep and often perilous waters represents the world. The wind that rises and is contrary is Satan who is trying to turn us away from our steady path home, which is the kingdom of God, i.e. the other side of the lake. The rough waves of the sea are the afflictions and tribulations, the trials and temptations which assail us during all our life. And of course... The crossing of the lake in the boat is the Christian life. The true lesson here is the Love of God. 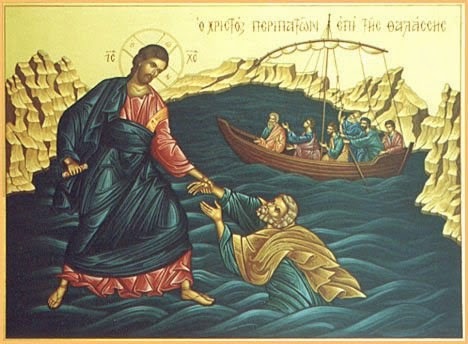 For even in the midst of the storm, Christ comes to the disciples where they are. In fact, the laws of the physical world are suspended in a supernatural way so that Christ could come directly to their aid and assistance. The disciples seeing this are struck with fear and awe, thinking that this is a spirit coming toward them... A ghost is you will. "All flesh is like grass and all its glory like the flower of grass. The grass withers, and the flower falls, but the word of our Lord endures forever." Powerful truth!!! St. Peter had the personal, first-hand knowledge of this truth. It was he who called out to the Lord and simply exited the boat to go out to meet the Lord where He was! And he was walking upon the water as Christ was because it was Christ who sustained him and lifted him up. But, Peter, bless his heart, he began to take his eyes off of Christ and started to pay attention to the storm and the squall rushing around him. And he began to sink. His faith left him when he took his eyes off of He who first came to him. How many of us can claim the same problem as Peter? But Peter began to call out, "Lord... Save Me!" And Christ did. In more ways than one, Christ saved Peter. Christ not only lifted Peter up and returned him to the boat in safety, but Peter confessed Christ for who He is... He is the Son of God! At this moment, the seas calmed and the winds died. Just as Satan's power to afflict the faithful dies at the confession of the truth of Christ's sovereignty over all of creation... so did the winds lose their power to toss the ship to the depths of the sea. Here is Christ in the truth of His nature. He holds dominion over all things. He is Lord and master of creation. Surely He is still as such to us even in this modern day.